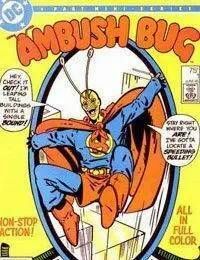 So we meet Ambush Bug in his ofice. After a phone call, something flies through his window. It is a doll, that the bug adopts as his ward and dubs CHEEKS THE TOY WONDER. Together they go out into the city to stop crime. Unfortunately on his first mission with his new sidekick, disaster did strike. As well as the Ambush Bug workout, and a visit to the home of Little Bug.